This collection consists of approximately 130 documents from the Biswell family of Randolph and Linn Counties, MO. The items were part of a gift to The E.M. Violette Museum by the Will of Susie Lee Clark (1887-1948) and include letters, financial documents, military papers from the early 1800s, and newspapers containing family obituaries. The bequest also included her piano, parlor organ, and other three-dimensional artifacts, as well as a collection of late 19th century sheet music (see Musdp Ms Collection C1). 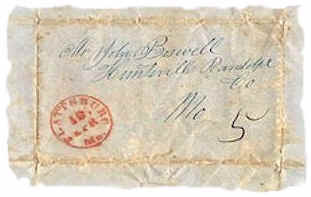 Miss Clark, a native of Brookfield, MO, was the daughter of James W. and Bettie Leah (Biswell) Clark and the granddaughter of Jonathan Huff Biswell (1830-1903), the young man who wrote most of the collection’s “Gold Rush” letters. She was a teacher in the Brookfield public schools as well as a piano teacher who gave private lessons in her home. Miss Clark attended summer sessions at Northeast Missouri State Teachers College during the 1920s and was awarded the Bachelor of Science in Education and life teaching certificate in 1931.